While the IdeaPads represent Lenovo’s more traditional clamshell notebook form factor for back-to-school, the Legion is a more upscale product. It’s a serious gaming laptop that packs plenty of performance. 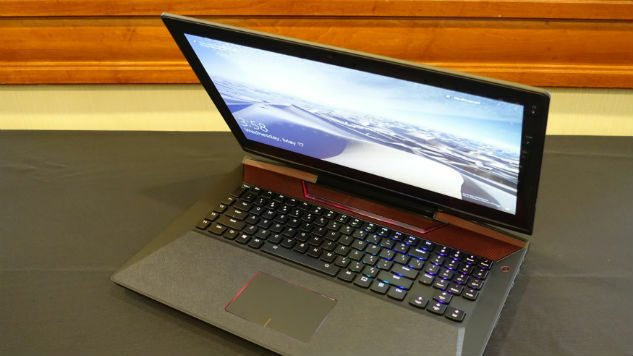 Since Lenovo revealed its new Legion branding for gaming systems, this is the company’s second notebook in the newly unveiled family. While the Legion Y920 comes with a similar design to the model that it succeeds, it does come with updated specs that make it more competitive with gamers, including VR-ready graphics support. The Legion Y920 comes with Intel’s overclockable processors in the Kaby Lake 7th Generation series. Options include an i7-7820HK CPU or an i7-7700HQ processor. The notebook ships with Nvidia’s GTX 1070 with 8GB of video memory, making it compatible with many VR experiences found today. There is 16GB of system RAM and you can configure the notebook with either a 512GB SSD or a 1TB HDD. With all that power, this notebook is heavy, weighing in at 10.14 pounds. The larger size, however, means that Lenovo is able to pack in an enhanced audio experience, which is useful for gaming and consuming content. The notebook comes with Dolby Home Theatre Audio, and includes two 2W JBL speakers and a 3W subwoofer to pump out bass. The notebook measures 16.7 × 12.4 × 1.41 inches and is constructed with an ABS plastic material. However, Lenovo did a great job to make the lid feel premium and look like metal. The keyboard deck is coated with a rubberized material, and the palm rest has a very rubbery coating, which helps with ergonomics during game play. While you’ll still get the same great backlit mechanical keyboard from the Legion Y920’s predecessor, what’s new to the Y920 is that the keys are individually backlit. I found the mechanical keyboard to be very responsive, and the new backlighting system means you can change the color of each individual keys, rather than just changing colors for general regions on the keyboard, giving you greater versatility and control in key mapping. It also creates a neat light show effect on the keyboard as the colors are cycled through. The Legion Y920 also supports a wide array of ports, with a single Thunderbolt 3 over USB Type-C, four USB 3.0 ports, HDMI, Ethernet, Display Port and a 6-in-1 card reader. The device ships with a 6-cell 90Whr battery. Pricing for the Legion Y920 starts at $2,699, and the system starting in June.